This past week was Spring Break, so I was off work, though I didn’t have any fun plans. I spent most of Spring Break doing Frigg-type things around the house like cleaning, grocery shopping, and cooking big batches of stews and casseroles to go in the freezer for days when I’m too tired to cook dinner when I get home from work. But the weather was so gorgeous Thursday that I decided to till the back garden. My acre of land is mostly wooded with more live oak and mountain laurel trees than we can count. It’s nice, but fruits and vegetables require full sun, so I’ve got them stuck in whichever sunny spots I could find. I ended up with one vegetable garden in the back, one in the front next to the driveway, and a row of dwarf fruit trees (consisting of a pomegranate, Meyer lemon, satsuma, kumquat, loquat, and fig tree) lining the street under the power lines. All the rest of the yard is in shade. 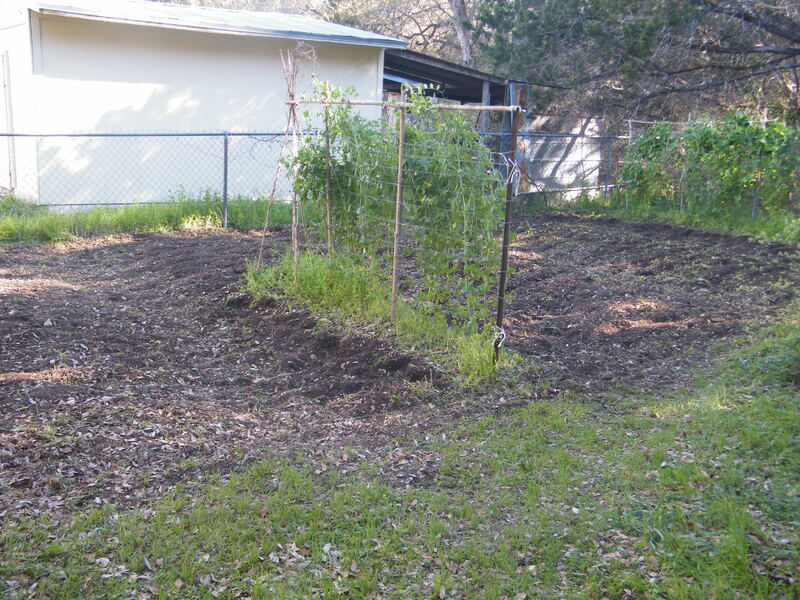 The front yard vegetable garden consists of four 4’x20′ raised beds framed with cedar with 3 foot paths between. I felt it was more important to get that garden looking nice since it’s in the front yard. I’ve got nothing but compliments from neighbors about it. It sure is nice to not have a homeowner’s association. The back garden is messier. Raised beds back there is further down on our to-do list, but I really should do it some time. Since I live in the Texas Hill Country, the ground here is like “would you like some soil with that limestone?” and our back yard is even rockier than the front. My husband is working on building a pond back there, and he dug down about a foot before he hit solid rock. He’s had to rent a jackhammer to work on the rest. However, the advantage of the back yard is that the deer don’t go back there. They could if they really wanted to. We only have a short chain-link fence they could easily jump over, but so far they haven’t bothered. Our deer are still picky and only eat the really tasty, easily-accessible stuff. For example, over the winter I tried to grow a mixture of salad greens in the front garden, and the deer ate all the lettuce, but left the arugula. I planted peas in the back this winter because deer find legumes especially delicious, but the rest of the back garden became horribly overgrown with weeds over the winter, especially this one particularly nasty weed that gets these sticky burrs on it. So this week I finally decided I would just till up the whole thing, hopefully uprooting all those weeds before it’s time to plant warm-season crops. But when you’re an animist, tilling the garden isn’t that simple. Before I got out the noisy machine with whirring blades that chops up the soil, mutilates plants, and will probably kill some earthworms and insects in the process, I felt I should give an offering to the land spirits first. A combination of thanks and apology for the havoc I’m about to wreak. I poured out a cup of milk for them, and sat there for a bit listening to the songs of the mockingbirds, cardinals, and chickadees for a while. Then it was time to let the rototiller rip! The high that day was 78, so it turned out to be sweaty work, but I finally got it done by late afternoon. 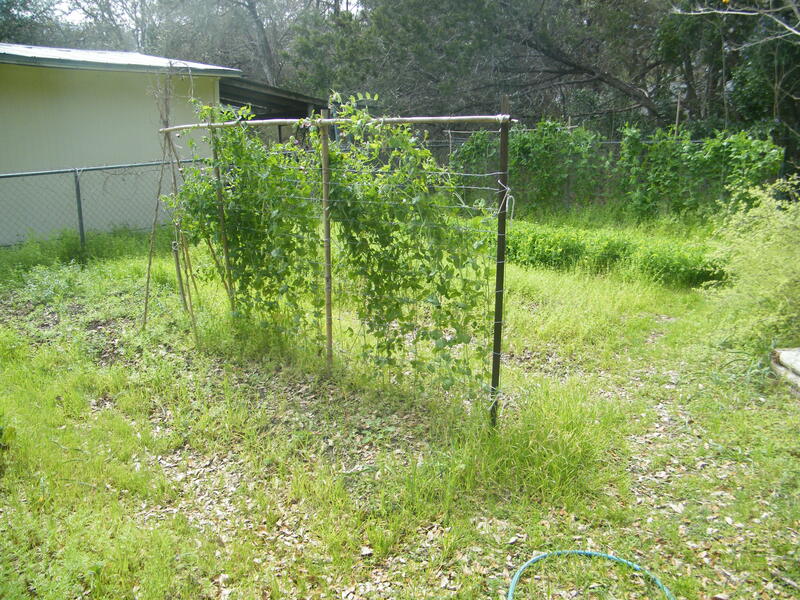 All that is left back there now are the two rows of peas on their trellises. I hope those sticky plants don’t grow back. 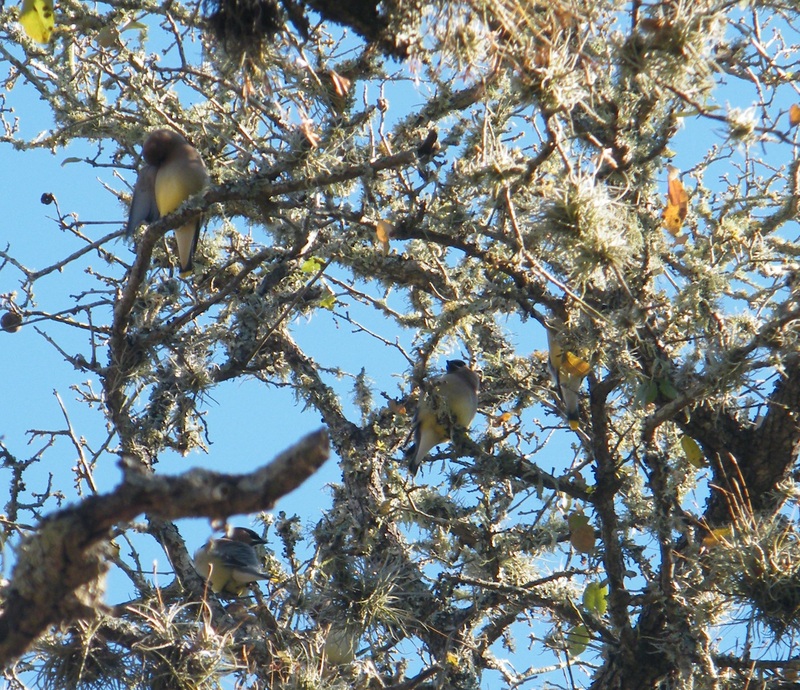 As I sat on the back porch resting, a flock of Cedar Waxwings landed in the tree above and preened themselves for a while. Live oak trees keep their leaves all winter and lose them at this time of year, right before growing catkins and new green leaves. So the oaks aren’t looking too good right now, and my porch is covered with fallen oak leaves. 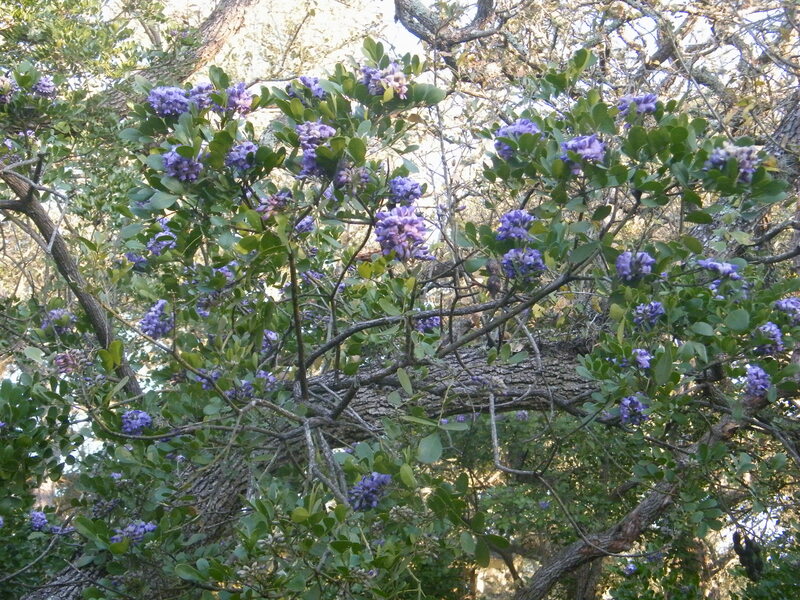 Meanwhile, the second most common tree in my yard, the Texas mountain laurels, are blooming and filling the air with their sweet, grape kool-aid fragrance. 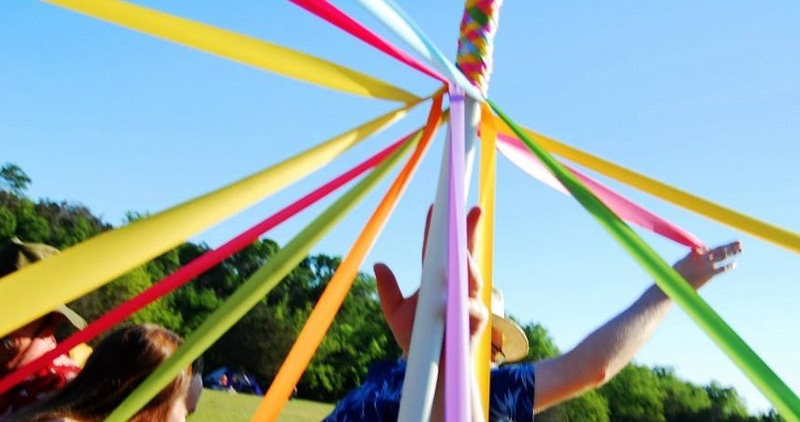 Friday morning, I went out to look over my work in the back garden again, before sitting on the porch to drink my coffee and listen to the dawn chorus. A chickadee landed in the tree above me and starting singing. It’s amazing how loud such a small creature can be. I listened to him for a while, and then a second chickadee flew over and landed right beside him. They started twittering frantically, and at first I thought they were fighting, since chickadees are somewhat aggressive little birds. But then I looked more closely and noticed that they weren’t fighting after all! Apparently that second chickadee was a female who really liked his song! The mockingbirds have already got chicks. I heard them chirping in the oak trees in the front a few days ago, and saw one of the parents catching bugs and bringing them up there. A couple of days later I saw a male cardinal picking out sunflower seeds from our bird feeder and giving them to a female cardinal perched above it (the bird version of giving your girlfriend a box of chocolates). Now there were chickadees gettin’s busy right above my head!